A while ago, I wrote a post about how we'd created a roof garden here in Wapping, London. That was almost a year ago now, and so I thought it time to write a little more about what's been happening in the garden this year and what I've been up to in the garden over the past few weeks. Generally, this time of year is quite dull in the garden. The tasks at hand are dead-heading and tidying and all the showy summer blooms are coming to an end. We still have a few roses and fuschias putting in a last flash of colour, but the whole thing is starting to fade to green as autumn creeps on. A few things, such as the mixed tub of cornus and abelia above, as coming into their own at this time of year though. The last few abelia flowers go wonderfully against the mixed foliage. As autumn fades, the cornus leaves will fall, leaving the bright red stems which will see through the winter until growth starts again in the spring. Fuschias haven't proved a huge success for us over the years. We planted this one a few years ago, and prompted by its success we decided to stock out an entire border with various fuschias. The first year was a wonderful riot of colour, but every year we have lost a few more plants and this year, it's rather disappointing. They are in a sheltered spot, and so shouldn't suffer from winter winds too badly, but I guess we just struck lucky with this one, which is continuing to grow and flower well in quite an open spot. One success story this year has been our pampas grasses. For five years, we've had one in each garden and despite lots and lots of healthy leaves, they refused to put up any fluffy plumes. Finally, this year, both varieties sprung into action and we have plumes galore. As you can see, the two different varieties have very different shaped plumes. The one on the left is has upright conical plumes, whilst the one on the right has feather-duster-like plumes of dark beige. Another plant which has come to life after a few disappointing years is our grapevine. This started out in a tiny pot on our balcony in the previous flat, and when we moved, we gave it a little more space. After a few years of half-hearted attempts at fruit, we have at least a dozen decent-sized bunches this year. Late last year, we added a second, purple-leaved, grapevine to the garden. It's not established enough to be fruiting yet, but given a few years, it should hopefully catch up with this one. This year, we planted runner beans for the second year in a row. I took beans from last year's plants and pushed them into the ground around the garden. As well as growing up formal beanpoles we grew them up trees, and as you can see on the right, up some buddleia. Formalists would scream at the sight of it, but I actually like the red and white flowers from the beans scattered around the garden. A few of the beans have already dried to a brown-y colour on the plants and I've collected the hard beans to keep in a paper bag over the winter and do the same again next year. 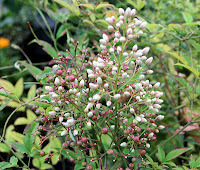 Now is the time of year when some plants start to put on the buds which will give the show next year. Garrya Elliptica (silk tassel plant) has got a covering of proto-tassels this year. Each one of these inch-long buds will turn into a foot-long tassel of seed heads next spring. This plant has proved quite slow-growing but worth the wait. Leycesteria is a rather forgotten plant. 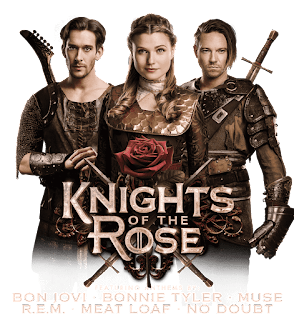 Despite being popularised in England in Victorian times, it's only in the last year or two it's come back into fashion. As you can see on the right, at this time of year, you get wonderful dark crimson berries. We've planted a small group of these plants overhanging one side of the pond and they have so far done very well. 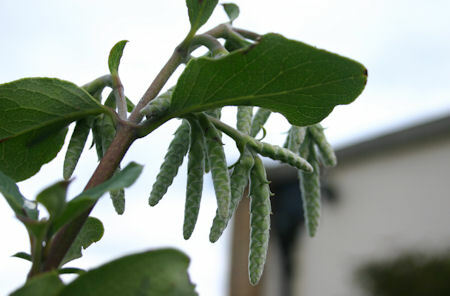 They grow in a similar manner to buddleia, with new growth from the ground every spring if pruned hard. 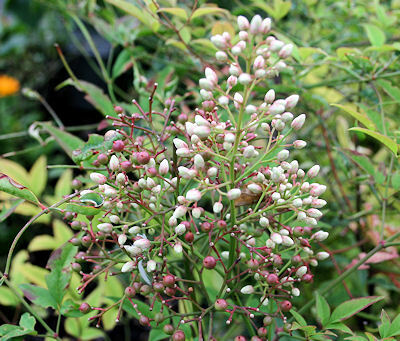 I've always have a soft spot for Nandina Domestica (left). We had three growing in small tubs for a few years, but as they grew pot-bound we transferred them into a long trough with a few ground-cover plants between. Originally we were providing them with winter protection from frost, but this loses the flowers and berries from view over winter when they are at their most spectacular. Last year we left them uncovered as an experiment and so far, so good. They are flowering pretty well this year, which bodes well for a profusion of red berries around Christmas time. One day, when I was feeling particularly brave, I took all of the irises out of the pond and divided the clumps. Keeping just very healthy tubers I created new clumps. Those plastic baskets you buy for ponds are very expensive, so instead I bought some black washing-up bowls and made holes in them. I secured the tubers into the bowls with soft wire and sank them to the sides of the pond. Not only has this created some space in the middle for the fish, but we've also added a bit more planting in the middle to give a nicer overall look to the pond. 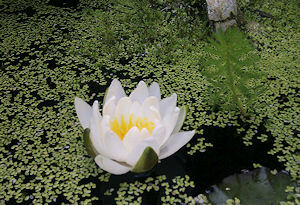 It's not only the new plants which have added to the pond. We have had this water lily for a few years, but previously it's done no more than throw up a tiny leaf every other year. But as soon as it was given a little more space in clear water, it has thrown up lots of leaves (as you can see above) and also produce its first ever flower. But maybe the greatest - and most unlikely - success story of our garden this year has been a very prolific agapanthus which has produced more seedlings than we know what to do with. Every year, our agapanthus put on a great display. 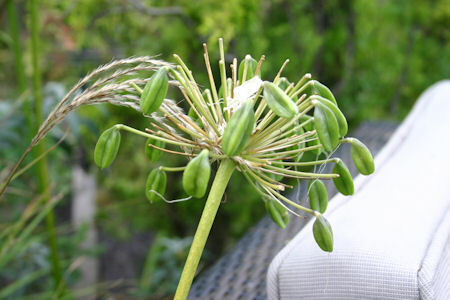 Once the huge flowers have faded, you are left with seedheads like the ones to the right . 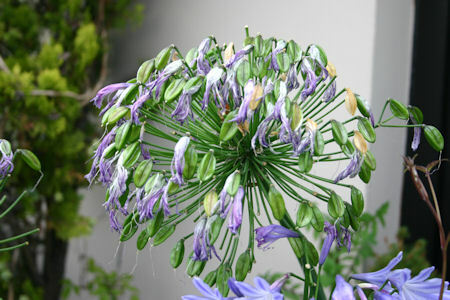 The largest agapanthus we have is one called "Enigma" which produces very large blue and white flowers. Last year, we left the seed head over winter as an experiment. It was around eight inches across and hanging above a patch of stony gravel. In spring we removed the seedhead and thought nothing of it, but then as the year went on, we noticed lots of little seedlings appearing. Very small at first, we pulled them up and they had very impressive root systems. Each seedling started off a couple of inches across like the one shown to the left, but within the year, maybe of them have grown to have leaves eight inches long. We have purchased a few unusual varieties to punctuate the border, but we have largely stocked a new agapanthus border purely with seedlings from the one plant. 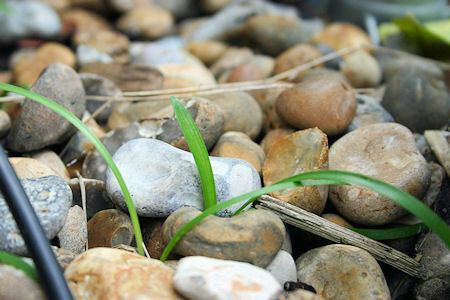 The seedlings to the left are still growing in September 2011, and they probably won't be the last. We have literally run out of space for these, and still have around 20 of various sizes potted up ready for a good home. So this is a serious request - if you'd like a seedling then please drop me an email and you're more than welcome to come and take some!